Matt & I went to see the movie Saturday night and I was so pleased. This review is hard to write because of the fact that I read the book and in this case alot was left out, whenever that happens it is hard for me to turn my mind off during the movie and to stop thinking about the gaps in the story. But at the same time I go into the movie knowing this will more than likely be the case! I understand why so much was left out- if they have based the movie on the entire book it would have to be at least 4 hours. 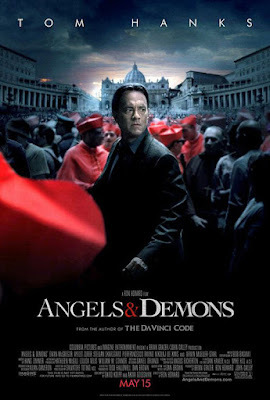 Now this movie was portrayed as a sequel when in fact Angels & Demons was written before the DaVinci Code! And one more gripe I have heard everyone saying “oh it was so much better than the DaVinci Code” yadda yadda but I ask what was wrong with the DaVinci code? I Loved that movie!! Moving on… the movie was wonderful, it was a on the edge of your seat thrill ride. I think it is fascinating that Tom Hanks character Robert Langdon is a “symbologist” and Tom fits the part of a well educated and worldly professor so perfectly in my opinion. Professional reviewers have said Tom Hanks character is too smart but that is the point isn’t it? Someone who has devoted their life to the study of symbols and how they relate? Anyways.. Vittoria the female lead I enjoyed but would of liked to see her play a bigger part in the movie, I felt that they kind of pushed her character to the ways side. If you like scavenger hunts, history, religion and thrillers then you will love this movie. I loved how this movie took you on a joy ride thru the Vatican and thru out Rome. This movie was highly entertaining and I would recommend it to anyone! Enjoy! ps……. I will have another post in a bit, I have not shared a recipe in while and I have a “Semi-Homemade” one you will love!